Dropping in once again with another post, however I feel I should drop in more often. Then again I wear a lot of neutrals so nothing really exciting to show. I might for some EOTDs in my spare time to share so hopefully I'll get inspired soon to do some. I've being working on some stuff so that's probably why I'm not around as much as I should. Anyway Last weekend on Saturday I got my hair coloured because my favourite Hairdresser was leaving :( I'm so sad because I loved her so much the way she styled me. She was such a sweetie and she always listens and suggests things when you get stuck not knowing what to do. I had no idea what I was really doing that day because when I got the news she was leaving I had to call in just to make an appointment. Saturday was her last day and I was her last client! Anyway that morning I woke up and I didn't know what I was doing. The day was nice with no rain and the sun was shininy, but it was still a little breezy so I had to wear a cardigan to keep warm. I was browsing through the blog list on my blogger and catching up with some reading when I came across a colour combination I loved! and Miss Krystle had done a looke inspired by Katy Perry. I've seen this look but I've never really thought about wearing it. 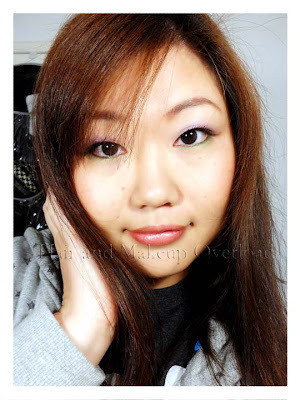 It's a look that Katy Perry rocked, with the purple on the lid and the green on the lower lash line. The blogger was gorgeous and the look suited her so well that I had to try it. It wasn't easy for me since I possess asian eyes so I don't have that double eyelid fold (bummer), but of course it meant I would have to improvise and work around to get it to suit my eye shape. 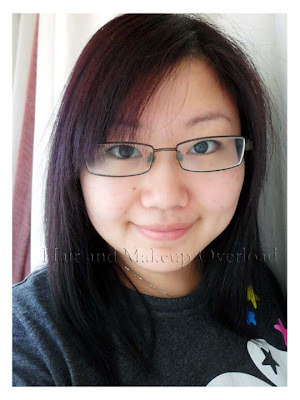 Mine didn't turn out as dramatic since I was going to the hair salon, but I loved the colour combination and it was certainly something different wear than my usual neutrals/browns. 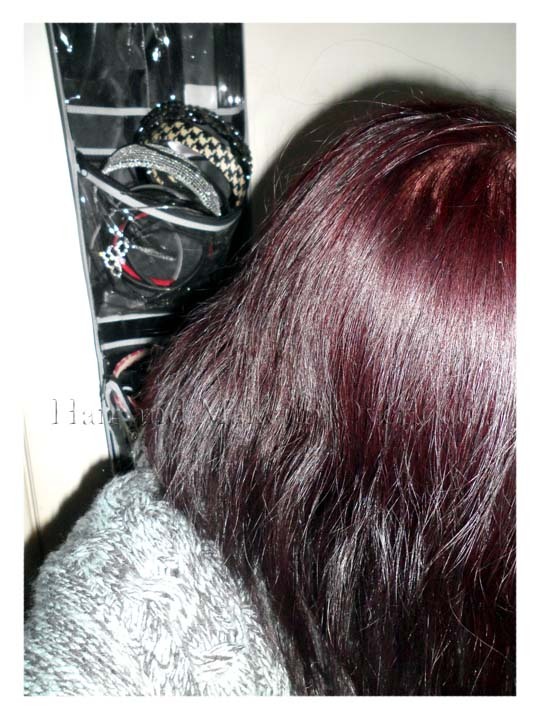 Here is the new colour, taken the following day with natural light from the window and flash. It's so dark, but it is actually a purple colour and probably a good colour since Winter had finally hit the scene where I live. Very cool. I LOVE it. I love that it's Katy Perry inspired :) It makes me feel like I should do something fun with my hair now! Loveeeeeeee your hair!!! I use to have hair this same color!! And I miss it terribly now! you look so sweet and preetty :) I love the purple eyeshadow!! Nawwww thanks girls! Loved reading each comments :) you guys made my day!